It’s colorful, it’s fun and it’s new from Discount School Supply®! This ocean-themed beanbag toss is perfect for summer activities and ties in swimmingly with the just released Pixar movie, “Finding Dory.” There is definitely high interest in what’s under the sea and especially the animals that live there. On one side of this vinyl-covered tossing wedge board you will find 4 playful sea animal targets—an octopus, a turtle, a crab and a dolphin—designed around large holes lined with mesh netting. The other side features the numbers 1, 2, and 3 next to jumbo mesh netted holes. Two red, yellow, green and blue beanbags are included and match the tossing targets. The tossing wedge has large holes, making throwing and tossing quite achievable for even the youngest child. When introducing new equipment to children, please allow time for free exploration and practice. Give children opportunities to throw from a variety of distances and to throw in different ways—thus enabling them to experiment and find the best position offering challenge as well as experience success. Encourage children to first toss the beanbag (slow or mid-paced looping throw using just fingers and hand) leading up to eventually throwing the beanbag (more forceful using arms and shoulders to propel the object). Remember that learning a new skill is a process and each skill has its own developmental progression. Challenge the children to throw the colored beanbags into the matching color holes, whether it’s the numbers, 1 (green), 2 (yellow), or 3 (red) or the 4 sea animals on the other side. Turtle=green, Octopus=red, Dolphin=blue, and Crab=yellow. Encourage the children to pretend the beanbags are “food” for the sea creatures. Ask, “What might they eat?” Have them verbalize the “food” they are feeding the turtle, octopus, dolphin, and crab. This activity not only expands the creativity and imagination but also children’s language skills. Children’s beginning math skills will be supported with this game. With the number side up, have children toss any 2 beanbags into a hole or holes. The child would then add up the numbers, i.e., one beanbag is the #1 hole and another beanbag landed in the #2 hole, thus making the total #3 (1+2=3). The game continues with each child taking a turn to toss 2 beanbags and stating the sum. Further challenge the children by having them toss 3 or more beanbags and add the numbers. Welcome children’s own ideas of how to move like one of the sea animals pictured, but here are some suggestions to get you started. You can make a game of this by asking children to throw a beanbag and whatever hole it lands in determines the animal they have to move like. Further challenge the children by having them balance a beanbag on a body part while they move. Crab Walk: Sit on floor with hands behind and lift up bottom. The trunk of the body looks like a table with hands and feet holding up the body (table). With feet or head leading, move like a crab. Octopus Wiggles: Start in the seated position on the floor. Attempt to lift both legs off the ground at the same time while wiggling legs and arms. Turtle Crawl: Starting in a kneeling position, curl back over and put elbows on the ground. Keeping bottom on heels, and elbows and hands on the ground, pull body forward in a slow motion. Dolphin Swim: Lying on stomach, with arms stretched in front and fingertips touching, rock back and forth on hips. Did I tell you that the vinyl-covered tossing wedge board folds flat for easy storage? One of my favorite ways to get some exercise is to get outdoors and take a walk. And living near the ocean always invites a beach walk. California has finally gotten some much needed rain, bringing with it strong winds and big waves. Driftwood washed up onto the shore and beach literally becomes nature’s playground. Look what my friend and I happened upon on a recent beach walk. Not sure if the driftwood teeter-totter landed that way naturally on the beach or was created by some playful individuals, but we didn’t lose any time taking advantage of climbing on and reliving our childhood memories. Just because you’re an adult, don’t let play get left behind and constantly replaced with deadlines, responsibilities, and the everyday demands of a career and family. Research has found that taking a break and having a little fun improves our problem-solving abilities, engages our imagination, and can increase our creativity. Go Outside. Breathe some fresh air; get oxygen into your lungs and brain. Exposure to sunlight produces the Vitamin D your body needs. Stop and smell the roses literally and figuratively—discover nature’s many wonders. Be Present and Live in the Moment. Capitalize on opportunities as they appear and appreciate fun when it occurs. Put down the smartphone! Do something spontaneous, preferably every day. Become More Childlike. And I don’t mean childish. They are different. Childlikeness is play-oriented and generous whereas childishness is defined by an inability to take responsibility and to see beyond our needs alone. Laugh More. Play and laughter go hand-in-hand. It stimulates the thymus gland, which helps to regulate the body’s immune system, encourages the release of “feel good” endorphins while reducing the production of the stress hormones (cortisol and adrenalin), lowers blood pressure, improves circulation and respiratory function while decreasing inflammation and infection. Spend Time With Children. Observe and learn from them the ingredients to become more playful—spontaneity, curiosity, and joy. Be a co-player and facilitator of play with children, not only of constructive, exploratory and dramatic play, but also of physical play. Connect With Playful People. Intentionally and frequently spend time with playful friends. Being with others will open your mind to new perspectives, ideas, and new ways of thinking, feeling. Being around people and being friendly and comfortable with them will increase the overall playfulness quotient. Rediscover the child within you and let him or her out to play! Cut a Rug with LET’S MOVE BATONS! Always on the look out for new loose materials to use for active play, I am totally in love with Discount School Supply’s “Excellerations Let’s Move Batons.” The six 10” long batons are made of sturdy clear plastic tubes with bright ribbon streamers inside that extend 13” from each end. They are easy to grip for small hands and user friendly for the toddler and the preschooler. The minute you see them, you want to pick them up—one for each hand! Start the music and bodies start moving. With a baton in their hand, encourage the children to dance and move about freely in the open space. Suggest to the children that they move or shake the baton fast, slow, high, low, side to side, and all around. Tell them that when the music stops, they are to stop and freeze (stand motionless like a statue). When the music starts again, children resume dancing. Ask children to follow along as you move the baton across the front of your body, circle the baton in front of your body like a Ferris wheel or circle it over your head like a helicopter blade. Try to trick the dancers by starting and stopping the music quickly. They love the element of surprise! Use all different types of music: fast, slow, classical, rock, salsa. When playing a slow song, suggest the children twirl, leap and float to the music. Put on some music and have children, with a baton in each hand, follow along as you cross left hand to the right side of your body, right hand to the left side of your body. Continue by crossing over and touching feet, etc. Now with only one baton, have children follow along as you make figure eights in the air, circle the baton around your body, wave it high, swing it low, and so forth. Each child is given a baton. Children line up horizontally next to each other with a baton’s distance between them. One child is chosen as the leader and stands in front of and facing the line. Play begins with the leader making a movement with the baton and the children imitate the movement with the baton they are holding. Direct the leader to make each movement slowly giving the group enough time to follow. The baton is a great piece of equipment to use at Circle Time for sharing and show-and-tell. The baton is passed from child to child sitting at Circle Time. A child who has something to share with the group, holds the baton and has the opportunity to speak about something that is important to them or share an item they brought from home and tell the group why it is special. The other children in the circle listen and can ask questions. The baton is passed around again and the next person in the circle holding the baton has a turn to share. A child has the option to pass the baton and not speak. Circle Time sharing and show-and-tell is complete when everyone has had a chance to hold the baton. In this activity, children build self-confidence and practice turn taking, listening, and speaking. Have children pick a rhythm instrument (tambourine, shakers, maracas, rhythm sticks or claves, cymbals, bells, triangle, drum, etc.) of their choice and line up behind the leader of the band—the drum major or majorette. The drum major or majorette leads the marching band, moving the baton up and down to the beat of the music while the children follow behind playing their instruments. Everybody loves a parade! Split group of children into teams and have them stand in a single-file line behind the starting line. Give the leader of each team a baton. To play, the leader runs with the baton in hand from the starting line to a turnaround point (i.e., cone, etc.) and back again, passing the baton to the next person in line. The game continues until each person of each team has had a turn to run with the baton. All I Want for Christmas is…TWISTER! Who remembers this all-time party and family favorite? It’s been around for close to 50 years and just got inducted into the 2015 National Toy Hall of Fame. Anyone can nominate a toy for hall inclusion, But to be inducted, they must have survived the test of time, be widely recognized and foster learning, creativity or discovery through play. I, for one, celebrate toys that do not support children’s wide use of screen play. Twister is a game of physical skill that has the players bending and stretching in challenging ways. Twister was conceived as a shoe polish ad as a game on a colored mat. The game initially seemed too racy, so Milton Bradley canceled production, but the game was played by The Tonight Show host Johnny Carson and actress Eva Gabor on air in 1966 and became an instant hit. The game was radical for its time, but was simple to play, as long as you knew colors and body parts. It was also the first game that transformed players into game pieces. Twister is played on a large plastic mat that is spread on the floor or ground. The mat has four rows of large colored circles on it with a different color in each row: red, yellow, blue and green. A spinner is attached to a square board and is used to determine where the player has to put their hand or foot. The spinner is divided into four labeled sections: right foot, left foot, right hand and left hand. Each of those four sections is divided into the four colors (red, yellow, blue and green). After spinning, the combination is called (for example: “right hand yellow”) and players must move their matching hand or foot to a circle of the correct color. In a two-player game, no two people can have a hand or foot on the same circle; the rules are different for more players. Due to the scarcity of colored circles, players will often be required to put themselves in unlikely or precarious positions, eventually causing someone to fall. A person is eliminated when they fall or when their elbow or knee touches the mat. There is no limit to how many can play at once, but more than four is a tight fit. The last player standing is the winner. Add a twist of fun this holiday season by giving the classic board game that ties you up in knots! 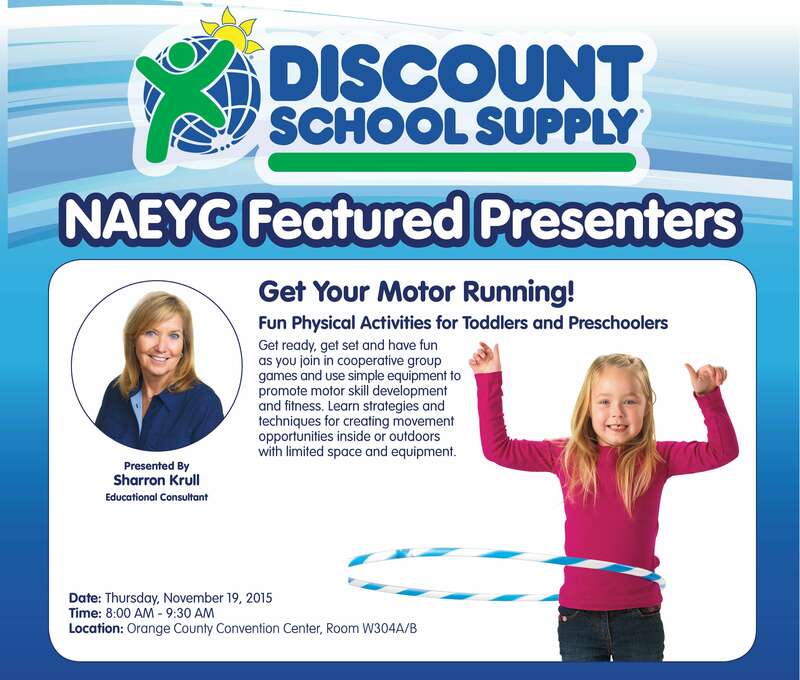 This is the title of the workshop that I will be presenting in Orlando, Florida, at the National Association for the Education of Young Children (NAEYC) Annual Conference on Thursday, November 19, 2015 from 8:00-9:30 AM. Why not join me, get your heart rate up, and increase the production of those “feel good” endorphins coursing through your body? There is no better way to jump start your full conference day than with some physical activity! I will be sharing and demonstrating lots of activities that you can do with two-to-five-year-olds in the outdoors or in limited space. In fact, I will be presenting this workshop in a room that holds 350 people set up theater style (i.e., many chairs and not much open space). But, I will have all attendees “up on their feet and out of their seats” as they “Mingle, Mingle, Mingle” around the room meeting other participants, then finding a partner, and playing some simple games (“Back to Back,” “Copy Cat”) using their bodies. Of course, that early in the morning we’ll also have to “Take 5 & Exercise” and then form in groups of three to become an “Exercise Family.” There is no better way to promote physical, social, emotional, and cognitive development than with total engagement of all our senses including the connection with our heart and mind! This is not just good for the kids in your care but also good for you! Why Play Musical Chairs When You Can Play Musical Hoops? Have you ever watched children play Musical Chairs? When the music stops, the kids push and shove to get to a chair. The first child who doesn’t find a seat sits out of the game, all alone. As the game continues, the kids can get more and more aggressive, stopping at nothing to be the winner. In the meantime, the losers may feel left out, bored or upset. This game is an example of a competitive game. Young children feeling left out is one of the reasons I like to recommend cooperative games for early learning, where every child is a winner. Cooperative games include everyone. Every child is allowed to stay involved, there’s no pressure to win, no fear or anxiety about losing. Musical Hoops is a cooperative game for young children that helps promote self-esteem, sharing, kindness and teamwork as well as develops spatial awareness, gross motor skills and listening. 1. 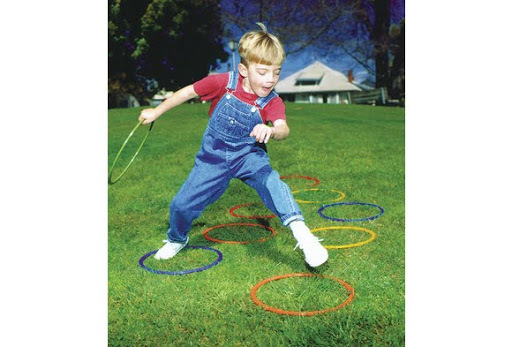 Scatter hoops in available space either indoors or outdoors. 2. Each child stands beside a hoop. 3. Start the music and instruct the children to walk around the hoops, making sure not to touch them while the music is playing. 4. When the music stops, each child steps into the nearest hoop. Tell them that it’s fine if more than one child ends up in one hoop. In fact, encourage it! 5. Start the music again and remove a hoop or two. When the music stops, the children step into the nearest hoop. 6. The game continues with you starting and stopping the music, gathering up more hoops and the children scrambling to all fit into the remaining hoops. 7. Musical Hoops ends with one or two hoops on the floor and all of the children working together to make sure everyone finds a place inside a hoop (even if it’s just one foot inside the hoop). It’s crowded but lots of fun! • Vary the locomotor skill children use to move around the hoop each time you restart the music. Ask the children to jump, gallop, skip, march or walk on tiptoes. • When the music stops and children stand in the hoops, ask them to count and/or show with their fingers the total number of people in their hoop.